By Daisy Brickhill, IIASA science writer and editor. “If you are the first to break a glass ceiling, you’re the one who gets scratched.” Tarja Halonen is a first for many things. She was the first female trade unions lawyer in Finland, the first female foreign minister for the country, and its first female president. She was also the first ex-president to spend her sabbatical at IIASA, meeting staff and discussing the institute’s work. 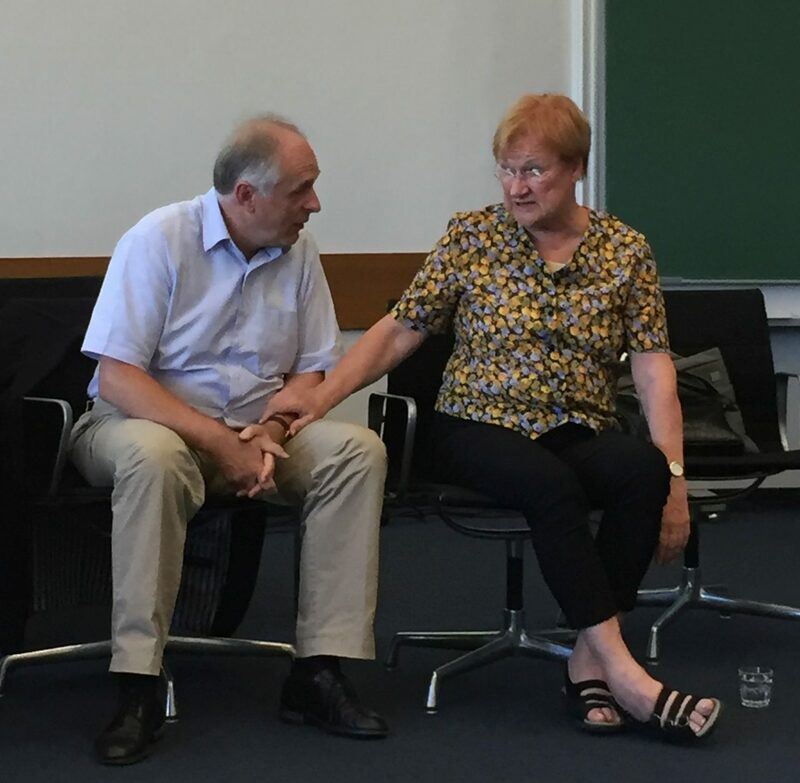 With a career rooted in social justice and a firm commitment to human rights, Halonen was eager to engage all at IIASA in discussions on equality and diversity, both within the institute and in wider society. A key stereotype that can strongly affect both women and men is that childcare is “women’s work,” and as such unimportant. Parents of both genders should be supported to be active members of their own family. Men are often excluded from this—there is no statutory paternity leave in Austria, for instance—and women, expected to take on the majority of caring, are in turn excluded from their careers at a key point, especially if childcare services are poor or prohibitively expensive. So how do we change things? All participants were eager to discuss ways of improving the situation. We can start by working from the bottom up, Halonen urged, doing everything we can in our immediate environments to improve things. Discuss diversity and equality issues as often as you can with as many people as you can. Be aware of your own unconscious biases, perhaps attend training to help challenge yourself, not just about gender but all types of diversity. Build pressure by enlisting the help of those outside your workplace too—visitors, funders, boards, and committees. President Halonen and Prof. Dr Kabat © Katherine Leitzell | IIASA. Importantly, the case is not hard to make: diversity and equality is good for everyone. “Even if we limit our argument to money alone we can still see clear benefits,” says Halonen. “Giving women more equality in Finland actually caused a rise in the country’s GDP. Turns out it wasn’t a smart financial decision to exclude half the population.” What a surprise. Top-down measures also have their part to play. Quotas for gender balance—on panels or in committees for instance—can be controversial but they needn’t be, says Halonen briskly. “Set the limits at 40:60 in either direction, and remember, quotas are not the end point, they are a step towards something.” Seeing women in positions of power is important not just as role models for other women, it is important for men, young men and boys in particular, who will grow up happy to work for a female boss, and benefit from collaborations with female colleagues based on mutual respect. There is hope in the air. As part of the Sustainable Development Goals all 193 member states of the UN have agreed that we need to achieve gender equality. Despite this, change won’t come as a single revolution, Halonen warned, it will come bit by bit as attitudes and rules slowly change. IIASA, as a thought-leader on sustainability transformations, can be a pioneer. After all, having equality and diversity at IIASA, an institute that aims to tackle problems across the globe, bridging cultures, peoples and genders, can only improve our science.